Although wary of the unannounced visitor inspecting his bike, Phil is initially less suspicious of Charles than either of his neighbours has been. Neither Sanders nor Jim would have let Charles get anything like as close to such an invaluable possession as a ten-speed racer. Phil's answers to Charles' distracting questions are short and to the point, as he concentrates instead on weighing up the motives of this talkative stranger. He is taken aback when Charles actually jumps on and sets off on his bike, and it takes him a few moments to react — by which time the thief is away down the drive and out of reach. 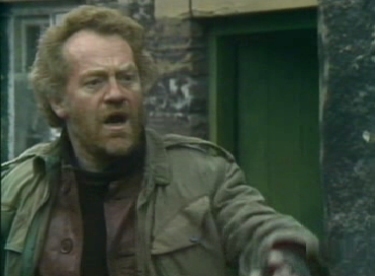 Phil will doubtless have kicked himself for his slowness when Sanders and Jim call on him (off screen) and he learns of the danger that Charles poses to them all. Angered by the loss of his bike, Charles' deception and the risk of a rabies epidemic, he readily joins Sanders' hunting party. He is still committed to the chase several days later when Charles is discovered leaving Ellen's farm, and he joins the horseback pursuit.